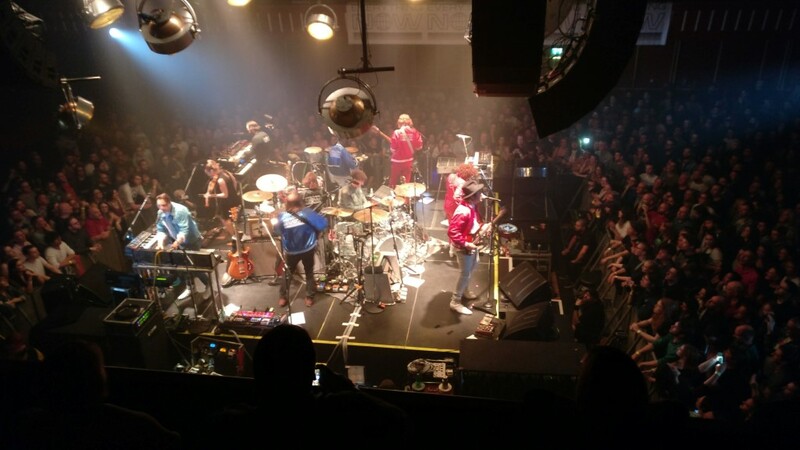 I was lucky enough to go and see Arcade Fire recently at a tiny venue. They were warming up for their summer of European headline festival appearances, and for some bizarre reason they chose The Baths Hall in Scunthorpe to play their first UK show. No, you’re not misreading it. That’s Scunthorpe in North Lincolnshire, just across The Humber Bridge from my home-town of Hull. Not London. Not Manchester. Not Birmingham. Not even a left-field venue like Blackpool Tower Ballroom. But Scunthorpe?!? Most people who live round here don’t even go there so how or why one of the biggest and best bands in the world decided to come, I will never know. When it was announced, one of my friends messaged me to let us know about it. 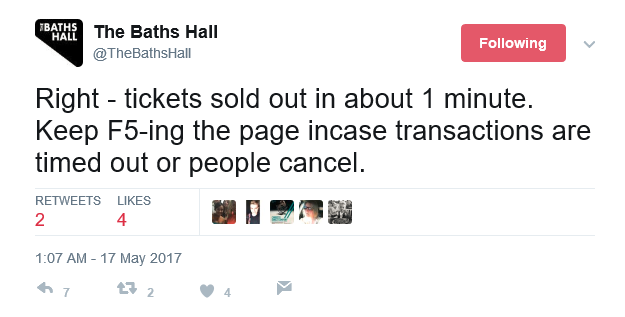 And the all important info of when tickets went on sale. It was the following morning at 9am. Sure it was going to be popular and sell out quickly, but I figured not many people would know about it and there’d be a good chance of getting a ticket if I was online at 9am. At 8:50 I found the right link on ticketmaster and watched the countdown clock tick down. Excitement was building in me. But also nerves. Doubts. Arcade Fire are my favourite band in the world and I bought their first album the day it came out. I’d only seen them once before and that was nearly tens years ago. What if I don’t get a ticket??? I was bricking myself. I’m not sure I could cope. Tick Tock went the clock. WHAT????????? This must be some sort of sick joke??? How is this possible????? Nooooooooooooooooooooooo, I screamed. I came out in a cold sweat. This cannot be happening. Surely?!?!? Yeah right. Keep F5ing. Who in their right mind is gonna let tickets slip through their grasp? I was all over twitter now to see what was going on. It was full of excited people who’d been lucky enough to get tickets posting triumphant messages. But keep pressing F5 seemed like my only option. So I did. I kept refreshing my browsers (I had 3 open) like a man possessed. What? WTF? BUY BUY BUY. Fill my basket. 4 please. >Sorry – only 3 tickets are available. 3 then. 3 is fine (Even 1 would be). BUY BUY BUY. Checkout. Need to register. Arse. Please Don’t disappear. Quick Quick. Pay Pay. What just happened? I’m emotionally empty. I’m a married man with 2 daughters and I run a business. Surely there should be more important things in my life? Pressing F5 like monkey was all that I cared about. I’ve spent the last hour on an emotional roller-coaster like I can’t remember in a long time (since Nicola, my youngest daughter was born, perhaps?). Most sane people would have given up when they saw that tweet. Indeed – all my friends did give up. But pressing F5 for 30 minutes allowed me to see the gig of a lifetime. I feel very lucky to have experienced this gig. It’s unquestionably my favourite gig of all time and was even better than I hoped or dreamed it would be. I feel very lucky indeed. My “hard work” paid off. Well, my refusal to give up at least since pressing F5 isn’t really that hard. Anyone can do it. But not everyone did.